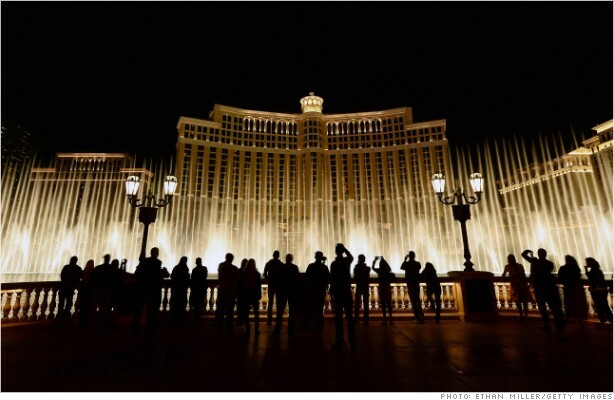 Hedge fund managers partied and talked shop at the Bellagio in Las Vegas, the site of the big SALT conference. "This is speed dating for hedge fund managers," said Mitch Ackles, president of the Hedge Fund Association. While the lineup of speakers, which included Appaloosa Management's David Tepper, former Republican vice-presidential candidate Paul Ryan and actor Kevin Spacey, is impressive, participants told CNNMoney that the real business happens on the sidelines. "If you see someone, it's okay to go up and talk to them," said Mike Winston, who runs the emerging hedge fund Sutton View Capital. "In a normal business environment, that might not be acceptable." Winston is looking to raise money and is also seeking a little advice. When he got the chance to talk to a major hedge fund lawyer about regulation, he knew the trip was worth it. "That would usually cost me $1000; here it's free," he said. The conference, better known as SALT, came into existence during the depths of the financial crisis in 2009, when the backlash against Wall Street excess was at its peak. "The president said to bailed-out banks you can't spend money on Super Bowl parties or boondoggles in Vegas, so all the hedge fund events were cancelled," explained Victor Oviedo, head of business development for SkyBridge Capital, the $10.2 billion fund of funds that throws the conference. "We saw an opportunity to fill that void." SALT also has a secret weapon in Anthony Scaramucci, its chairman and mouthpiece. Affectionately called "the mooch," Scaramucci plays host at the conference, pumping up panelists and shooting the breeze with anyone and everyone. "I just introduced Valerie Jarrett," Scaramucci said, referring to President Obama's senior adviser and close confidant. "I'm a Republican, she's a Democrat. It's the power of ideas, without the personal attacks," he said. SALT has also done wonders for SkyBridge's brand. The company has quickly grown its assets under management since the conference's inception. But SALT is also about changing the perception of hedge funds, and moving the industry from a shadowy corner of the financial world into the public conscience. Many conference attendees talked about how increased transparency and cooperation at the conference was a good thing. "These people are competitors, but they've been opening up to each other. That's pretty impressive," said Howard Lodge, who flew from Rockville, Maryland to court investors for his firm, Quantum Financial Advisors. "It's the surroundings, you're sitting here at the Bellagio, I think it relaxes people."